Looking for a luxury caravan that can accommodate all the family? 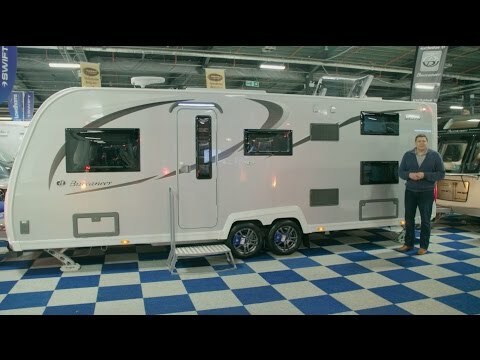 Watch and see if the twin-axle Buccaneer Galera does it for you! Buccaneer might have been under the Explorer Group banner since 1999, but it has its own identity and its caravans feature an all-singing, all-dancing specification. The big news for 2017 has been the switch over from GRP sides to aluminium with a silver finish, and a new profile. The 8ft width has been retained, but although the brand is still mainly for couples, Buccaneer now has a six-berth built to the usual standards. Now, we’re aware that not a lot of families can afford a super-luxury caravan costing around £32k, but this is where grandparents might step in. The Galera is ideal for grandma and grandpa to whisk away the grandkids for a weekend or longer, yet the tourer retains a luxury ambience. The new model offers a section at the rear with fixed bunks, so grandparents or parents can have the rest of the van to themselves. So is this a layout that has potential? Or will most buyers opt for the fixed-bed, four-berth options? This big twin-axle tourer rides on a BPW chassis with smart alloy wheels, and a Winterhoff hitch stabiliser plus an IDC electronic stability system. The new silver sidewall graphics really look the part, while the front and rear moulded panels are full-height and of a very smart appearance. Wheel locks come as standard, and the Buccaneer has an easy-to-operate remote-control self-levelling system – ideal for a fast set-up. A Telco TV aerial is fitted, as is a 100W solar panel along with external mains and gas barbecue points. The whole thing benefits from Explorer Group’s SoLiD construction, which cuts out 95% of screw use, lowering the risk of leaks. The Galera is a stylish caravan, with a large front gas locker and smart chromed grabhandles. A sunroof is fitted, while huge rooflights also bring plenty of brightness into the interior. There are two external lockers, with all the service points located on the offside. The lounge is a glamorous place to sit and enjoy the view, cossetted in the lap of luxury – surely too good for kids to scramble over! Up front, a chest of drawers in the centre offers storage and a coffee table, while there is additional storage in the overhead lockers. A CD player and radio is fitted up here, too, with the speakers neatly placed in the front corners. The under-seat areas also have access flaps. As we’ve already noted, lots of glazing means that the light really floods in during the day. But at night there is also plenty of illumination, too, with corner reading lights, ceiling LEDs and integrated over-locker lighting. The lounge is a real comfort zone, then, and has seating for four – with young children, that could easily rise to six. There’s also a side dinette, where the family can sit during mealtimes, with extra-width wraparound seating and an adjustable, single-leg table. As in the main lounge, there’s good lighting and plenty of power points in here, too. A well-specified kitchen is essential for six, and the Buccaneer Galera comes up with the goods. There is a Dometic fridge and separate freezer, a microwave, and a full Thetford Aspire oven with a gas and electric hob. Excellent worktop space is also a plus point, and includes an extension flap. There’s an extractor fan overhead, and storage is a further positive with three super-sized drawers, plus cupboards and overhead lockers that come with integral lighting and two LED downlighters. The sink unit is in a granite-effect and is quite large, but for six it needs to be. There’s also a smart, smoked-Perspex roof locker that doubles up as the drinks cabinet – nice! The Buccaneer Galera’s corner washroom is a swish affair, even if it isn’t particularly large. Its separate shower cubicle has a mock-tile effect, giving it a domestic feel. Surprisingly on a tourer at this price, no window is fitted here. Although plenty of natural light comes through the roof vent, a window would have helped to make the area even brighter. There’s a pull-out drying rail, a Thetford cassette loo with a concealed cistern, and a smart freestanding handbasin adds to the high-class finish. With the Alde heating system, you also get a plush, domestic-style chrome radiator, too. The settees in the front lounge can be used as single beds, but at 1.81m (5ft 11in) they aren’t overly long, so most users will no doubt make them into a double measuring 7ft x 4ft 9in. But here comes a little surprise: the bed-making system in the Buccaneer does feel a little low-cost. It relies on pull-out slats when we might have expected it to have used slide-out seat-base extensions. They tend to give a more upmarket impression because they don’t involve messing around with slats that can jump off their runners. Making the side dinette into a second double is an easy task, though. The resulting bed isn’t as large as that up front, but it is really meant more for children or occasional guests. The two fixed bunk beds at the rear each have a light, curtain and window, plus good headroom. Opposite them is a small table with seating. This should prove popular with kids, even if it can’t be made into another bed. Overall, the Galera offers some good storage opportunities, including deep overhead lockers in the front lounge, which continue over the side dinette. The chest of drawers adds more space, too, as do the bed boxes. The kitchen, as we’ve already mentioned, comes with ample drawers plus a large cupboard. The worktop is good and is improved further by the extending side flap. The size of the wardrobe should prove no problem during weekend breaks, although for longer tours you may have to start considering what not to take. However, if – as we reckon – the Galera is often going to be used as a four-berth, then the wardrobe should be ample. And there is further storage beneath the bottom bunk base, and under the two small seats opposite the bunks. The washroom has a pair of cabinets – one above the loo, the other beneath the sink – and overall storage is hard to knock. The Buccaneer Galera offers an excellent specification, but there’s no getting away from that price-tag. Nonetheless, this caravan should appeal to well-heeled families, or grandparents looking for luxury but who also need space for taking grandchildren on tour. The van feels strong and sturdy, and has all of the equipment you need to make year-round caravanning easy and comfortable – Buccaneer’s philosophy since 1969.